Welcome to the HTLAL Book Club 2015. Its creation came about because of a need on the forum to have a place where people can discuss about the books they read instead of about how many books or pages they have read. This is not the Super Challenge, which I encourage all learners who wish to make a dramatic improvement in their language skills to do. This is about books in your TL's (this includes English for English learners and graphic novels, BD's, comic books or whatever you prefer to call them). You are encouraged to write in any TL if you wish, but it isn't required. If you do write in TL, then you must include either a translation into English or, at least, a synopsis in English of your main points so that everyone may benefit from possibly discovering a new book or writer, even if they don't speak your TL. Your translation doesn't have to be word for word, UN translator standard. Recommendations of books to read are welcome, just flesh them out a bit instead of posting a simple list. If you have read, or are reading, a book in TL translation from English or a TL translation from another language, this is ok. You can, indeed, talk about these books here. No one should post links to illegal downloads as per Forum Rules. Quotes from books should be attributed to the author of said book or the book's title. Images: Images can make a post fun, but keep in mind that too much of a good thing can spoil that fun, be judicious about image use. Please try to edit the size of images you post so that they don't expand the screen width in such a way that it makes reading a chore of scrolling back and forth from left to right for every line on the page. Please check your post to see if the photo is too large. If you can't edit the image to fit within the optimum screen width for reading, please delete it and provide a link instead. Please keep other members in mind. One post with giant photos can ruin a whole page of posts for everyone else. If this happens, feel free to point this out to the poster. Another fun way to illustrate a post is with links to publisher or fan-made "book trailers" (similar to movie trailers) on youtube. Disagreements: If you disagree with someone's post about a book, please, try to disagree without being disagreeable. Lastly, enjoy! Let's talk about books!" What do you have to do to join? There's no sign up list. The membership is everyone who enjoys reading in a TL. So, post, read and enjoy! Let's talk about books! As we say goodbye to 2014 and will say hello soon to 2015, what have you read this year that has moved you? What did you find to be pleasantly unexpected? Did you discover a great new author or book you would like to share with the community? What are your reading plans for 2015? This year I got around to reading quite a few novels including Platform by Michel Houellebecq, The Wind Up Bird Chronicle by Haruki Murakami, and Kafka on the Shore by the same author, House of Leaves by Mark Z. Danielewski. The Girl who Played with Fire by Stieg Larsson, & 2666 by Roberto Bolano. I'd say those books were the biggest for me this year aside from the various thrillers and intrigue that I've read. A few books I didn't end up finishing include White Noise by Don Delillo and The Broom of the System by David Foster Wallace. Houellebecq's work was exactly as I'd expected. Saddening and depressingly realistic. Although I don't think Platform is one of his best, it's still classic Houellebecq in the sense that it depicts contemporary society and our new needs as we continue to grow technologically and begin to adapt to new customs as well as ideas. Murakami's two works that I'd read were, let's say, refreshing compared to what I had encountered in the first novel I read of his, Norwegian Wood. For me, Wind Up Bird Chronicle is way better than Kafka, but from what I've seen people tend to choose one or the other as their preferred so I'm not too surprised I feel this way. House of Leaves tried way too hard to be edgy and breakthrough. It sort of ruined the book for me because I felt as though it could've been a great story. I found myself having to skip a lot of pages and even a few chapters. I felt the same with 2666 as I did House of Leaves. Actually, the first part was great and the fifth was good too. But, the middle could really drag on at times. -Read more Fantasy/Science Fiction. Especially Patrick Rothfuss' series and book 5 of A Song of Ice and Fire. Maybe Robin Hobb too. -Attempt to get through the Department Q series by Jussi Adler Olsen. I loved book 1, stopped half way through book 2, and was somewhat disappointed by book 3. I've heard the 4th is good though. My major milestone was finishing my first (and so far, only) book in Irish ("An Hobad, nó anonn agus ar ais arís" - "The Hobbit, or there and back again"). I used the English original as a crutch. Detailed version in my log. Current plans: finishing the book I'm reading at the moment;Cú na mBaskerville (some 50 pages left), and maybe the two Alice in Wonderland books (also in Irish), the second (and third) volume in the Millenium series (in Spanish), maybe something in German/Russian... I'm an avid reader, and can start and finish at least half a dozen books per week (on a good week, that is). I have made both the book and the film thread sticky. Excellent initiative by the way. 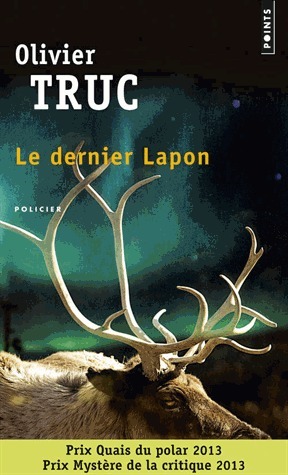 My best and most surprising read this year was probably Le Dernier Lapon by Olivier Truc. In the days when I still read fiction, more than ten years ago, I hated crime fiction. As a Swede displaced in France, with a penchant for the occult, I couldn't let this one go, though. Truc is a French journalist, living in Sweden, writing about a Sami murder and the disappearance of a traditional shaman drum. I enjoyed the pace, I loved the characterisation, and I was pleasantly surprised to find that the Sami were not overly exoticised. My biggest accomplishment was probably just reading fiction again, and, of course, switching all of my reading for pleasure over to my main target languages. I've read 21 books in French this year, the average length of one of these books being around 300 pages. I also finished my first book in Breton this year: Harry Potter ha maen ar furien by J. K. Rowling, which is obviously a translation of Harry Potter and the Philosopher's Stone. I started it after studying Breton for two months, so I was doing it as a side-by-side read with the English original. By the end, though, I was reading entire chapters on my own. That was a huge accomplishment for me. A big failure, though, is that I've failed to finish a much shorter book written originally in Breton... the worst part is that it's not because it's terribly difficult. I just underestimated how much I dislike the "short one/two-page episodes from everyday life" format, so when I always reach for something else. My current goal is to plough through it before New Year's, so I can start the new year reading something enjoyable. My goal for 2015 is just to keep reading a book or two in French every month, and to keep reading Breton a few times per week. I also intend to throw a few of the French classics in there, but I don't want to ruin the pleasure of reading by deciding beforehand how many or which ones. I definitely became much more of a reader this year than I used to be, especially in foreign languages. I also read some Houellebecq: La possibilité d'une île. I agree with sillygoose1's comments on his writing, and I'm keen to read more of his work. For Italian reading it was a great year... Looking back I'm quite impressed with myself! I got through most of Niccolò Ammaniti's work. His stories tend to be crazy, funny and sad all at the same time. And full of colloquial modern Italian. My absolute favourite was Ti prendo e ti porto via; I also read and enjoyed Io non ho paura (maybe that was in late 2013, I can't remember now), Io e te, Che la festa cominci, and his two short story collections Fango and Il momento è delicato. By Italo Calvino I read Le città invisibili, Gli amori difficili, and Palomar. His writing is beautiful although quite challenging for a learner! Another highlight was Enrico Brizzi's Jack Frusciante è uscito dal gruppo. It's not for everyone, but I loved it as the main character, an angsty teenager into rock music, reminded me of my own adolescence, and it's set in my favourite Italian city, Bologna. Thanks for the thread, iguanamnon. believe a read around their B1-B2 level may already enjoy it.